Excited to be getting on a plane to Hong Kong this weekend! 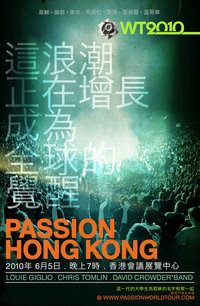 I’m headed to Asia to help out with the Passion World Tour stop in Hong Kong for the week. What an honor to serve alongside such a beautiful mission to lead young people to live lives that shine fully for Christ! And what an amazing honor to do that in China! Please pray for our team as we pull together last minute details and logistics. Please also pray for the thousands of 18-25 year old students who will fill the arena on June 5th and give Glory to our amazing King. Believing God for amazing life change in this very lost place. Bryson will be holding down the fort while I’m gone….so pray for him too!! It’s really REALLY hard for me to leave the kids (and I actually HATE to fly! ), but it is so good for my heart to challenge myself and do things that God calls me to be a part of. I trust him with my kids and hope that them seeing me do things like this will challenge them to do anything + go anywhere for the cause of Christ! Have a great trip and take care of yourself! Hi Emily! I am so grateful for Andrea’s “introduction”. I will email you to see if you have time on your schedule for a coffee / lunch / or dinner in Hong Kong! Following the link now to learn more about this exciting event for our great city! or visit our blogspot at http://www.everydayadventuresinfaith.blogspot.com! Brave, brave girl. I have a hatred/fear for flying too. Have fun and can’t wait to hear about it! Wow! Sounds like it will be an awesome trip!! Can’t wait to hear about it!! Nice to meet you! Now while you are in Hong Kong be sure to hug my friend Kim! I’m so excited for you both and will be praying for your team and the teens! I did! Kim and I had a GREAT time talking! So glad to have met her!